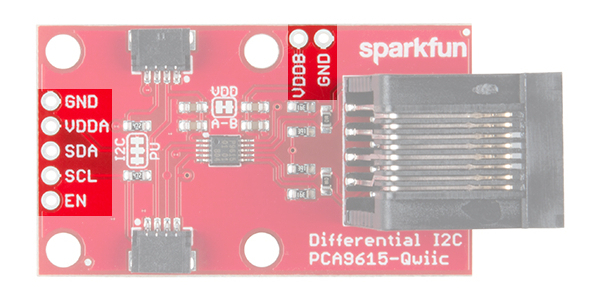 The Qwiic Differential I2C Breakout is the fastest and easiest way to extend the range of your I2C communication bus. 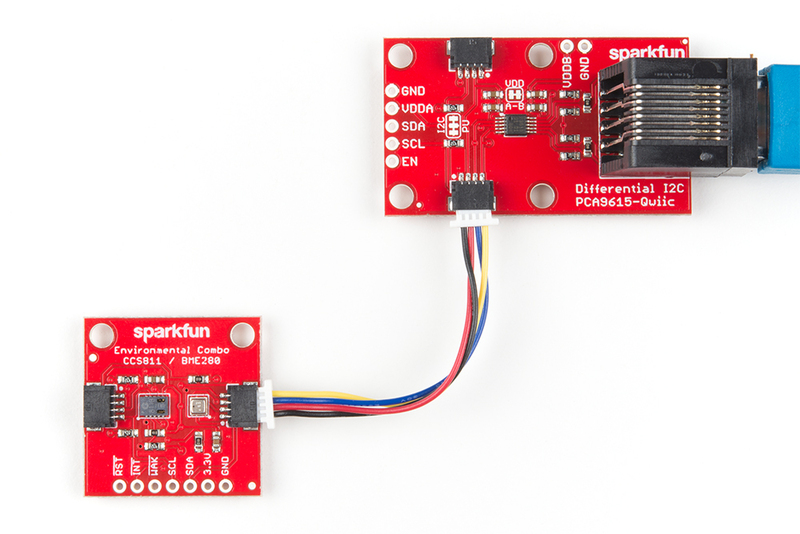 The breakout uses NXP's PCA9615 IC, which converts the two default I2C signals into four differential signals: two for SCL and two for SDA. 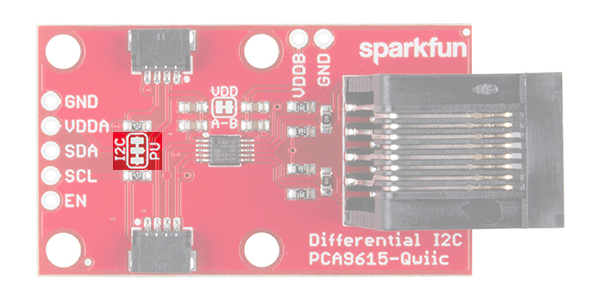 Coupled with the ease of SparkFun's Qwiic connection system, the differential I2C breakout board makes it easier to connect it to the rest of your system. The differential signals are sent over an Ethernet cable, which attaches to the breakouts through the on-board RJ-45 connectors. The differential signaling allows the I2C signals to reach distances of up to 100ft. while still maintaining their signal integrity! To follow along with this project tutorial, you will need the following materials. You may not need everything though depending on what you have. Add it to your cart, read through the guide, and adjust the cart as necessary. 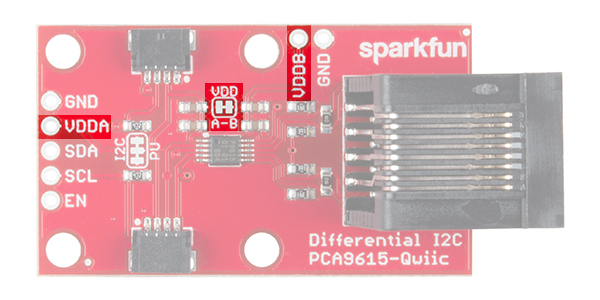 2x Qwiic Differential I2C breakouts. A straight-through Ethernet cable (up to 100ft in length). A microcontroller or single board computer capable of I2C. An I2C sensor to communicate with on the other end of the I2C bus. If using the Qwiic connectors, two Qwiic cables. You may need a soldering iron, solder, general soldering accessories, and a hobby knife depending on your setup. We would also recommend taking a look at the following tutorials if you aren't familiar with them. 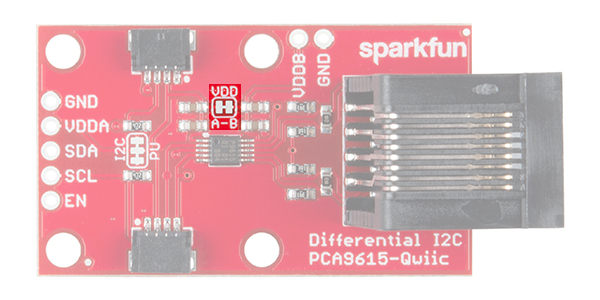 The simplicity of the Qwiic differential I2C breakout is one of its biggest appeals. Other I2C communication methods require packetizing I2C communication into another protocol, be it RS-485 or 1-Wire. 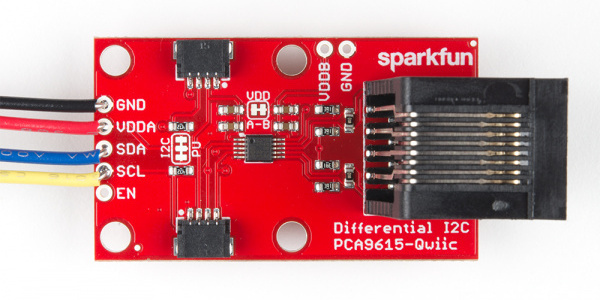 However, the PCA9615 keeps the I2C protocol by utilizing a differential transceiver. 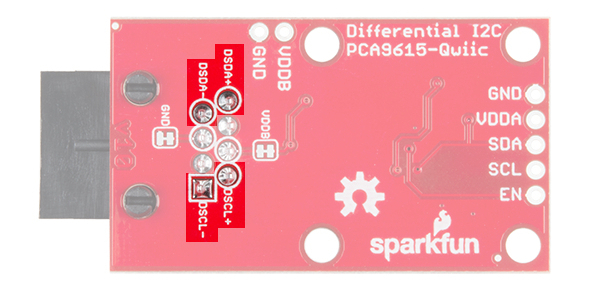 In this section, we'll take a closer look at the board to better understand how it works. Below are the plated through hole pins that are broken out on the board. The I2C pins are connected to the two Qwiic connectors on the sides. VDDA - 2.3VDC to 5.5VDC. I2C-bus side power supply. VDDB - 3.0VDC to 5.5VDC. Differential side power supply. 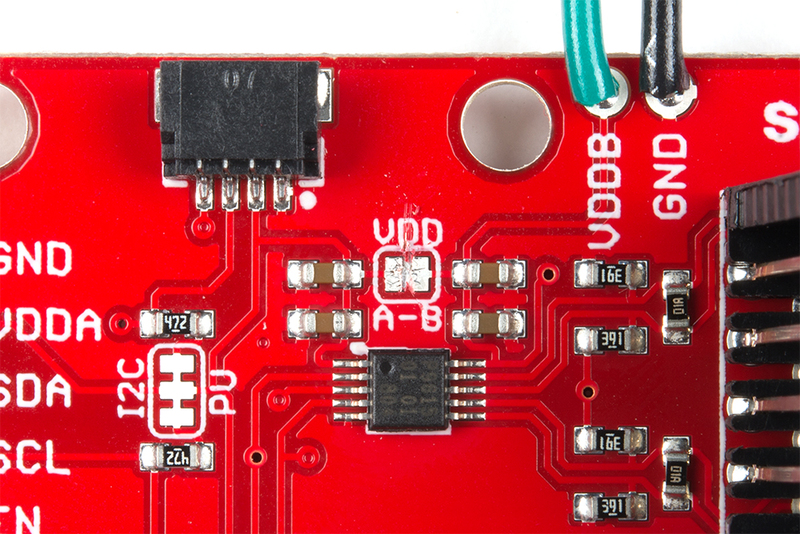 If jumper "VDD A-B" is not shorted, then VDDB will need to be powered for the differential I2C bus to operate. SDA - I2C data signal. SCL - I2C clock signal. EN (optional) - PCA9615 enable (active high, internally pulled up). This is used to disable the bus buffer, and is useful for fault finding, power-up sequencing, or reconfiguration of a large bus system by isolating sections not needed at all times. 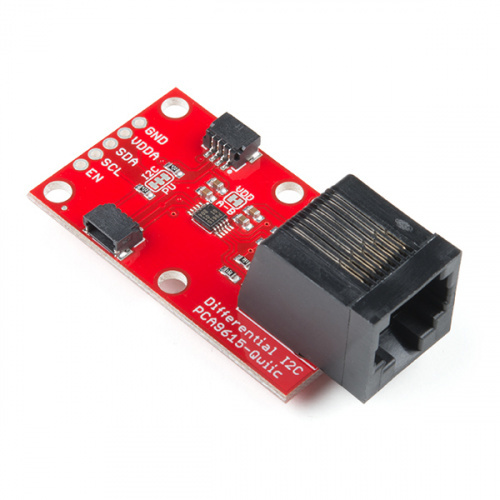 VDDA - 2.3VDC to 5.5VDC. I2C-bus side power supply. If "VDD A-B" is not shorted, VDDB will need to powered separately for the differential I2C bus to operate. To power the board, VDDA must be present and be the same logic voltage as the SDA/SCL lines, while VDDB is used to power the differential I2C bus. By default, the jumper labeled "VDD A-B" is closed, which connects the VDDA rail to the VDDB rail. By cutting the jumper you can separate the two rails which would allow for one rail to operate at 3.3V while the other can operate at 5V. 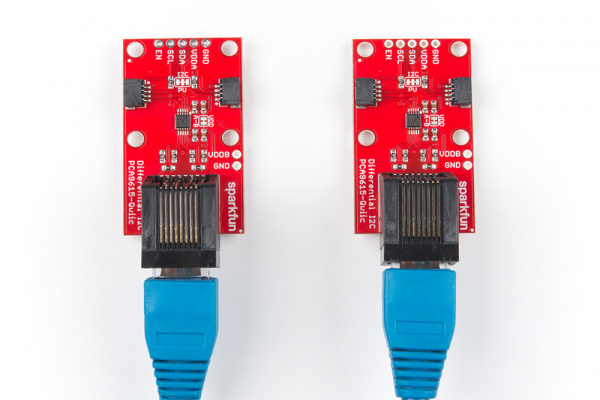 If the number of sensors connected on the other side of the extended I2C bus is minimal, you can power them over the Ethernet cable. However, if there are numerous sensors connected, it is advised that both ends be powered separately. To isolate the power supplies at both ends of the Ethernet cable, use a sharp blade to cut the small traces betweens the pads of the jumpers labeled "VDDB" and "GND". VDDB will still be present on each board, but the Ethernet cable will not carry any current to power a device at the other end of the cable. From the bottom of the board, we can see which pins the RJ-45 connector uses for the differential signaling. The board has been designed to use a standard Ethernet cable. If a custom cable is made, make sure to connect a twisted pair for pins 1 and 2 (DSCL-, DSCL+) and pins 7 and 8 (DSDA-, DSDA+). As with most SparkFun I2C products, there is a jumper for the pull-up resistors on the I2C bus. If multiple sensors are connected to the bus with the pull-up resistors enabled, the parallel equivalent resistance will create too strong of a pull-up for the bus to operate correctly. As a general rule of thumb, disable all but one pair of pull-up resistors if multiple devices are connected to the bus. Ethernet cables used must be straight-through (i.e. Pin 1 on one side of the cable is connect to pin 1 on the other side. The same for pin 2 and so on.). 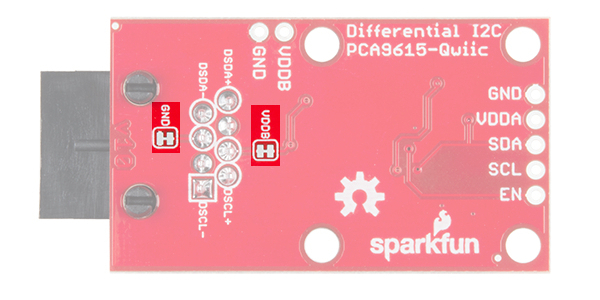 Remember, each individual non-differential I2C bus needs at least on set of pull-up resistors enabled. Make sure you keep track of which devices have their I2C pull-ups enabled and which do not. With two power supply rails and quite a few jumpers, it's easy to feel confused about how to power the differential I2C bus extender. In this section, we'll go over the different ways you can power your project. 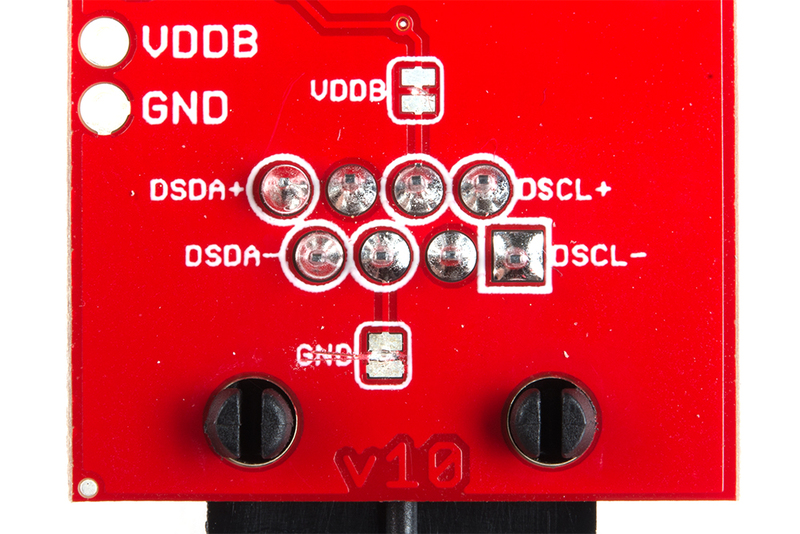 VDD_A and VDD_B are connected. Both are powered at 3.3V. Power is connected to a twisted pair of the Ethernet cable and sent to the slave nodes. No power is required at the slave nodes. VDD A-B jumper trace has been cut. Separate power supply (3.0-5.5V) is supplied to VDD_B, while VDD_A remains at 3.3V. VDD_B voltage is connected to a twisted pair of the Ethernet cable and sent to the slave nodes. Jumpers underneath board (VDDB and GND) are cut and power is NOT connected to the Ethernet cable. Each slave node is powered individually with 3.3V only. Differential I2C signals are the only connections on the bus. VDD A-B jumper trace has been cut on the top of the board. Both are powered at 5V. Each slave node is powered individually with 5V only. Differential I2C signals are the only connections on the bus. You'll also need a straight-through Ethernet cable (up to 100ft). You'll first need to solder the headers on to the Qwiic shield and then connect the shield to the Redboard. 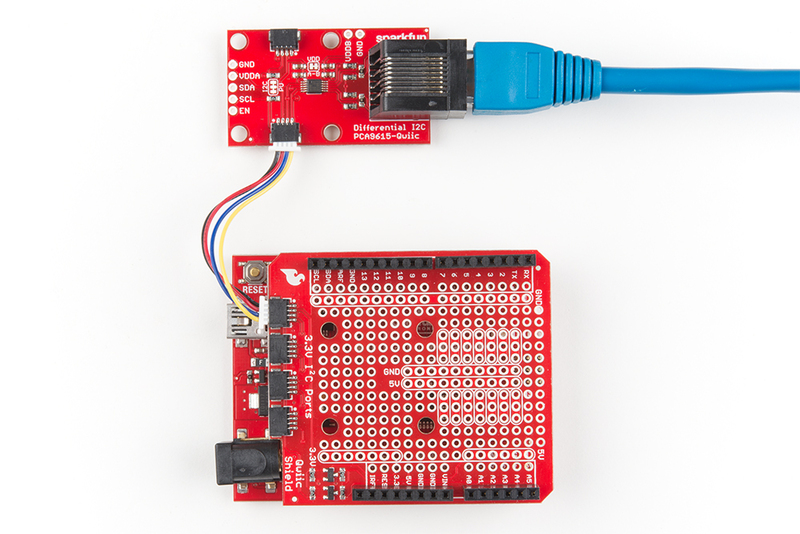 Once that's done, you can connect one of the differential I2C to your Redboard as shown below using one of the Qwiic cables. On the other end, all that's needed is to connect the environmental combo sensor to the other differential I2C using another Qwiic cable as shown below. We're going to use the code from the environmental combo sensor's hookup guide. Sense various environmental conditions such as temperature, humidity, barometric pressure, eCO2 and tVOCs with the CCS811 and BME280 combo breakout board. With the sensor connected via the I2C bus extender, we will use example 2 of the environmental combo breakout. Assuming that you have installed the library for both sensors, copy the code below and paste it into your Arduino IDE and upload the sketch to your board.